WordCamp US 2016 was a blast. Needless to say, the second WordCamp US event I attended was a phenomenal experience for me and I believe for all other attendees as well. My time at WordCamp US 2016 was a weekend well-spent. My expectations for WordCamp US were all met and this has been one of the best WordCamps I’ve ever taken part in. I will be sharing with you all the things I did in WordCamp US, all the nitty-gritty of my experiences in those four days of WordCamp US 2016. 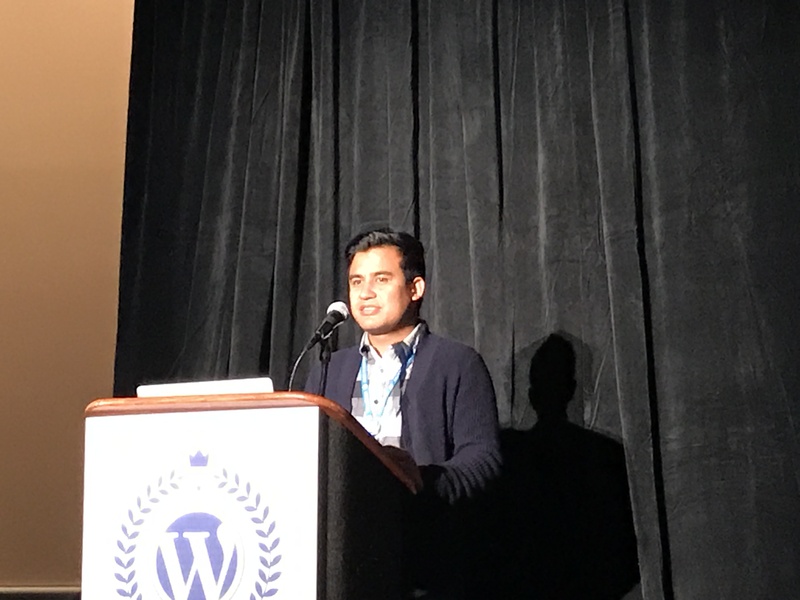 In a diary entry fashion like I did for WordCamp Europe 2016, here’s all that went down with me at #WCUS 2016. Not wanting to be late in any way, I reached Philly on Thursday morning, at around 10AM. I took a short rest in my room after the flight. Later I met with Harshad Mane, Lead Organizer of WordCamp Nashik, India; and we went for coffee at Starbucks. In our exchange, we shared the experiences of being Lead Organizers and talked about WordCamps in Kathmandu and Nashik. The evening had its own agenda, for we had the WordCamp US Speakers/Volunteers/Organizers party. The event was great for networking. I met few new faces and had a chat with the familiar ones. The opportunity to meet the WordCamp US team was just awesome. Additionally, I got a chance to meet various WordCamp organizers. Like I wanted to, we talked about WordCamp Asia and WordCamp Bangkok. We all agreed that Bangkok would be a good place to organize WordCamp Asia. To my surprise, I received a “Thank you” gift pack from the WordCamp US organizing team. The box was beautifully wrapped and inside were Thank You Card with signatures, WordCamp US Chocolate, WordCamp US Whiskey Glasses and WordCamp US Diary. The gifts are very much appreciated and the Whiskey Glasses are just too cool. The morning of the first day of the event, I reached Pennsylvania Convention Centre at 7:15. After I completed my registration, I joined the Volunteers’ Venue Tour guided by Liam Dempsey. I volunteered at the Happiness Lounge. Volunteering at WordCamps is very exciting and it is one of the things that made my time at WordCamp US 2016 entertaining. It’s funny but it was the volunteers themselves that needed more help than the attendees. I was able to successfully guide a few people on how to create a child theme and register menu. Later, I met some of my old friends – Tammie, Ulrich, Jenny, David, Joe and Otto. I also met Petya Raykovska, Milan Ivanović and Noel Tock from the WordCamp Europe team. I exchanged a few words with WordCamp organizers from different parts of the world- Harshad, Rahul, Jon Ang and Fumiki Takahashi. The WordCamp US Team was brilliant and extremely helpful. Huge thanks to everyone I met with for making the event so enjoyable. Later that day, we went to parties organized by Go Daddy Pro and WP Engine. I also met Jeff from WordPress Tavern. We talked about WordCamps in Nepal and how huge of an impact it has made in Nepal. The most awaited day for me on WCUS 2016. I was to deliver my talk on this very day. I was so excited and a bit nervous. However, all went well and I delivered my speech in the morning. I shared the Q&A session with Shayda Torabi. It was pleasant and I was very happy as this was a day I’d been waiting for. I had imagined that I’d speak in WordCamp US someday. But the day came a bit too soon. Everything went smooth and the experience was quite interesting. Moreover, I got a chance to meet many delightful people making my time at WordCamp US 2016 so much more interesting. Getting acquainted with Charleen Mullenweg was very interesting, she’s a really fun and engaging person to be with. I also gathered along with other people like Vova Feldman from Freemius, Brent Shepherd from Prospress, who helped me solve issues we had in Catch Themes with the WooCommerce Subscription. Similarly, I volunteered at the Get Involved table. I was happy to get the opportunity to explain to others on how and why they should give back to WordPress. After attending the State of the Word by Matt Mullenweg, we went for dinner with the Jetpack team after having been invited by Sam Hotchkiss. It was amazing to catch up with my old friend Rich Collier who used to work with me in Moguldom Media Group. Furthermore, I made some new friends from the Jetpack team – Derek Smart, Brian Colinger, and Igor Zinovyev. Finally, it was time for the WordCamp US After-party. The party venue—The Academy of Natural Sciences—was so spectacular that once I started exploring the place and meeting and networking with fellow WordPressers, I lost all track of time. The After-party left me a bit tired and I ended up waking a little later than usual. I went directly to the contributors’ hall. I started to contribute with my amazing teammates Jenny and Ulrich. During lunch, I happened to meet Brian Krogsgard from Post Status and we shared a brief talk about WordCamps in Nepal. After the Contributors’ Session, my time at WordCamp US 2016 was over. I bid my farewells to WordCamp US 2016 and took an evening flight to Atlanta. My time at WordCamp US 2016 was a celebration. It has left me with a heart full of happiness and a mind full of newly energized ideas. I am proud to have been able to represent my country in the international tech platform. I dream to take our WordPress community even further towards success. As of now, I’m home with my family in Atlanta. Meeting my mom and dad after so long, we have a lot of catching up to do. I also plan to take my son, Saksham, to Walt Disney World Resort in Florida. I’ll be back in Kathmandu next month and will bring back many more stories. See you in 2017, Kathmandu! This entry was posted in Travel, WordCamps, WordPress and tagged Philadelphia, WordCamp, wordcamp us 2016 by sakinshrestha. Bookmark the permalink.